Due to holidays in Japan and the U.S., market volatility is low. The pair USD/JPY failed to leave the limits of the channel of 104.11-104.42. Although US statistics can affect further movement in the pair, leap in price is not expected. 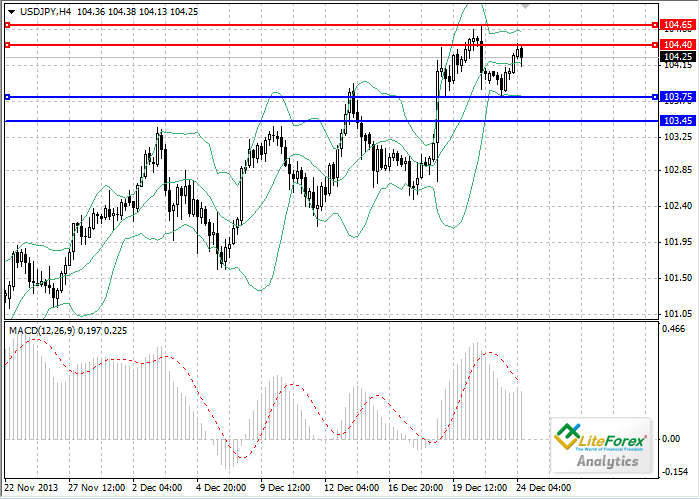 The Yen is still under pressure from “super” soft monetary policy of the bank of Japan. USD/JPY rate has reached the five-year highs and the “bulls” will need strong fundamentals factors in order to raise the rate higher up. On the four-hour chart technical indicators give mixed signals. Bollinger bands are in the sideways, indicating calm market. MACD histogram is in the positive zone forming a weak buy signal. Support levels are 103.75 and 103.45. Resistance levels are 104.40 and 104.65. In case of conservation of the current trend, it is recommended to open short positions from resistance levels of 104.40 and 104.65 with the targets of 103.75 and 103.45.